Wendy and I have spent the past four days in St. Petersburg, the "Venice of the North." Petersburg is many things: Czar Peter the Great's capital and "Baltic Window to the West," "Cradle of Lenin's October 1917 Revolution," and site of the 900 day siege in WWII by the Nazis. For us, Petersburg is a delightful place to stroll along its many canals and Neva River waterfront. Petersburg feels more European than Moscow. And for me, at least, there is a lot less of the lingering "Soviet Era" feeling than in Moscow. 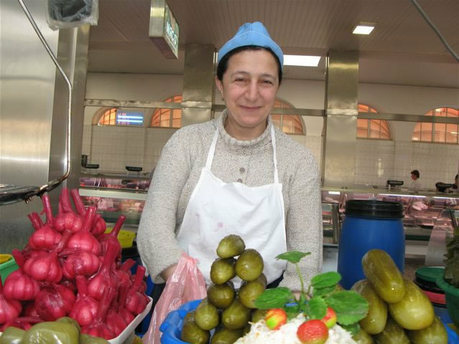 Shown above is a Petersburg Pickle Peddler showing off her goods in a local market. Notice the pickled garlic. Yummmm! We bought some and also some cabbage and salmon pierogis at a bakery around the corner and had a very satisfying lunch. We were also fortunate to attend a performance of Tchaikovsky's Swan Lake ballet in the intimate Hermitage theater (250 seats). The dancers were truly wonderful, and I will always remember that evening. The one souvenir I bought in Petersburg was a 4" high metal action figure of the religious monk Grigori Rasputin, who was an advisor to the Czarina Alexandra. We visited the Yusupov Palace where Rasputin was murdered by Felix Yusupov (and others) in December, 1916. We had an appointment to see the actual basement dining room where he was poisoned and shot. Real history! I took this photograph of my Rasputin figure overlooking the canal just in front of the site where he was murdered. Other Petersburg highlights were the Amber Room (it glows) at the Catherine Palace and the interior mosaics at the Church on Spilled Blood (they seem to glow as well). An American, a Frenchman, and a Russian were trying to determine the nationality of Adam and Eve. The American said, "Adam and Eve were clearly Americans. They had abundant material wealth all around them. For them, it was paradise." The Frenchman said, "Adam and Eve were French. They were beautiful and had a passionate, loving relationship." The Russian said, "Adam and Eve were clearly Russians. They were naked, cold, and had only an apple between them to eat. Only a true Soviet would call this paradise!" 1) These are boom times in Russia (at least in the larger cities). About anything you want is available (and expensive). 2) There are lots and lots of white people in Moscow and Petersburg; neither city would be confused with any American city. 3) We enjoyed our time here, and we also enjoyed preparing for this trip: we watched a number of Russian films (see here), viewed the Czar, Lenin, and Stalin documentaries from the History Channel, and benefited from Irwin Weil's Teaching Company 36-part series on Russian Literature. We also read various books, and highly recommend David Remnick's history Lenin's Tomb (winner of the Pulitzer Prize), and Sergei Lukyanenko's sci-fi novel Nightwatch. Oh my, the joke reminds me of the many European jokes growing up. There were always assorted nationalities and punch lines for each. Rasputin's story has long been part of my favorites for mystery and intrigue. What a fun coincidence, we are in Worthington, OH helping our son move in to OWU, & I am reading your blog from Russia. And I've enjoyed both! Thanks Roger, St Petersburg's one of my 'must see' places - I'll get there one day, thanks for whetting my appetite still more. Valeria: I, also, have long been curious about the Rasputin story and murder. From our Russian guide, though, we got a much different -- and less damning -- interpretation of Rasputin's influence and final days. Fred: Thanks. Glad to hear your enjoying your time in my home town! Mark: Thanks for the link to the poem. I enjoyed it and its Russian references. this is a great entry- I esp enjoyed the action figure set up- thought Rasputin is usually portrayed as so crazy and strange... the still figure seems rather calm in comparison. love the joke. why aren't there more immigrants coming into Russia from other countries? hmmm. have a good trip home!